现场报道：枫翎个展《度》，一场度人度己的理解 Feng Ling’s Solo Exhibition "Scanner" kicked off at 16:00 pm on Sep 26th, 2015. Feng Ling solo exhibition "Scanner" at Being 3 Gallery. Following Feng Ling’s amazing behavioral-installation “Si- the future gift” in 2014 of the second China-Italy Biennale, this time her exhibition “Scanner” presents us her works of mixed media on canvas. In this group of works, she uses a large number of ready-mades from her daily meditation like ash, ink, arrow, lace and other basic elements, implanting into the works. Arrow and lace, ash and ink, are two pairs of contrary and parallel language. Arrow points to strength while lace points to gentleness; ash points to religion, while ink points to art, bursting out and binding up together. The encounter and impact that the all-in-one-step ultimate pursuit and insatiably exploration of passion have made constituted the unlimited tension of Feng Ling’s work language. Language teller is who has been confined. 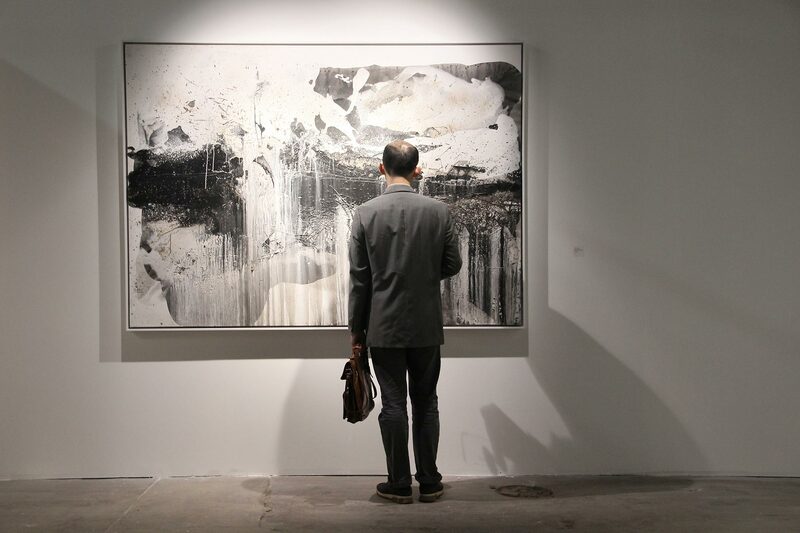 In Feng Ling’s opinion, art is a kind of ultimate concern and repair of human nature. She studies Zen Buddhism, and integrates ash left from her meditation into the exploration and test of materials, transferring practice into art and transferring art into the practice, which made the practice and art into comforting pills of life. Feng Ling's works are meditative and spiritual by themselves, such as "scanner", "fleetness", " I think, therefore I am” etc…… Meanwhile her works are also wonderful, poetic and fascinating, which is like being obedient after contesting, and being calm after a deep understanding! This has been presented in the series of Zen, which releases a power of peace and limpidity. Feng Ling’s experiments and deep understanding at this phrase have been embodied through the work 108 degrees. 108 is a mystical number, standing for ultimacy, auspice and "getting rid of all the troubles of life” etc…… Feng Ling’s 108 degrees, which was obtained after repeatedly experiments, constitutes of marks that burn out from 108 incense sticks. This includes a vivid experience of process, time, existence and life, which is like the experiences and dedications of every individual in the history of life, and till the eventual end. Everyone’s fate is same, but their imprints are different. The meaning of human life lies in the process and experience of existence. The whole exhibition is not only a simple display of the artist’s works, but also a perfect reproduction of her exploration struggling with the process of seeking art and life. As the good space that the curator of the exhibit originally arranged, the reversing space layout and the tortuous creation of works combined together, as well as the spiritual echo between enlightenment of foyer “+” and “108 degree”. Feng Ling’s solo exhibition “Scanner” is already an understanding of liberating people and ourselves.